I love knitting, but sometimes working from vintage patterns isn't all it's cracked up to be. I have been working on and off on the lovely sweater pictured above for over a year and a half now, and was really excited to finally finish it this week. Unfortunately, the collar (i.e. the reason I picked this pattern in the first place) looks nothing whatsoever like the illustration. What the?! What happened? I re-sized the pattern but kept all the original dimensions of the sweater. Everything fit perfectly together like a puzzle, so I know there wasn't a mistake in my calculations. But somehow the collar illustrated looks nothing like the final result. There are two points on the collar, but even after blocking it twists oddly so the bottom point disappears. Also, there is no way the collar can stand up like in the picture. Just not possible. It also sits much farther back that illustrated. So all and all, nothing like the picture. It's quite disappointing when so much work goes into something and it turns out sub-par. Other than the odd collar, I quite like the fit of the sweater so I'm trying to come up with a way to alter it. I don't have enough yarn to knit a new collar though. Anyone have any suggestions? I'm going to have to do a more fail-proof project next to lift my spirits. Maybe a hat? Hey, I can totally understand you, it's really frustrating, when you put so much effort in a project and the results is not what you expected. Did you already try to iron the collar? Maybe you can also use some "ironing spray" to get it more stand up. Although the sweater doesn't exactly look like in the picture, it really looks cute one you :) good luck with your next project! I did try ironing it a couple times, which worked for a few minutes until it rolled up again. I don't have any "ironing spray", but I will have to keep an eye out for some. Thanks for the suggestion! Thats what I hate about knitting. It takes so much effort to create something and along the way you can only guess what the result will be. Fixing something takes a lot of time too. Yes, knitting is certainly time consuming. In some ways I prefer sewing to knitting. If something doesn't fit right it's usually much easier to fix when sewing. You can unpick seams, re-cut things, etc. With knitting, often if something is really wonky the only option is starting from scratch! I'm not sure what to suggest for getting the collar to stand up, but perhaps you could put in a little stitch to hold the lower points of the collar in place against the body of the jumper? I think it still looks nice though, even if it doesn't look like the illustration. It makes me wonder what the reaction of women of the time would have been. Like, would they be disappointed as well, or were they used to the artistic impression of the finished article being a bit different to the reality? I don't have a huge amount of experience with vintage patterns; I've knitted a few that have worked out fine but also abandoned one or two that didn't seem to work at all. No problems as yet with the picture differing from the finished item though. I've come across other vintage illustrations that seem more based on fantasy than reality. It seems to have been a common problem. 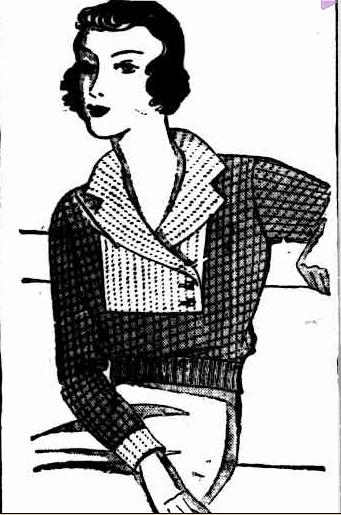 I've had a couple sewing patterns from the 1920's that could not possibly look anything like the illustration. How disappointing, they are such lovely colours together. Have you tried spray starch? I have had some success with it on wool. You can't even sew it down, can you? I had a disastrous knit recently, which is still on the needles, so annoying. I've never used spray starch before, but I will have to look into it. Thanks for the suggestion! I follow your blog although I've never commented before, but felt I had to say the sweater still looks really sweet, and your colour choice is lovely. I don't really knit, but I cook, and I know the frustration of realising a recipe got published without being properly tested - can't imagine how that must feel after months of work! What a shame that collar didn't work out... :( The pattern of the body, and the colors are so lovely ~ I can see how disappointing that would be. I'm not an experienced knitter, but it looks to me like the yarn choice was the wrong variety for that part of the pattern? Like, using a roll-y jersey instead of cotton in a dress! I did try to use a modern equivalent to the yarn suggested in the pattern. I think it rolls since it is done in stockinette without any kind of edge stitch. how sad! if you don't know about the original pattern it actually looks quite pretty ... but i know this doesn't help - you know how it should look. 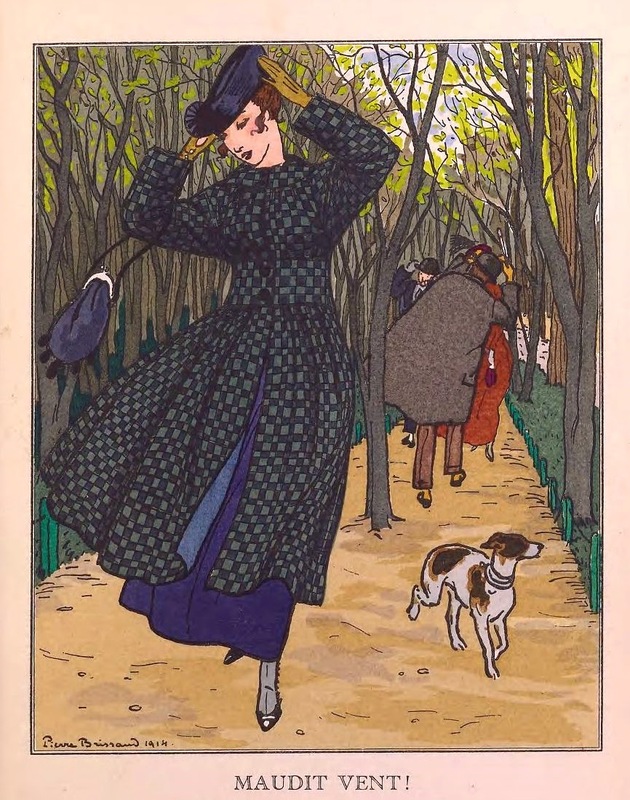 This is the curse of vintage patterns isn't it?! Sometimes you get to the end and it just isn't right, even though you knitted it to the pattern. How frustrating for you. Knitting a jumper takes so long, it is so upsetting when it isn't what you hoped for. I do rather like it as it is though. Beautifully done. Yes, knitting is such an investment in time that it makes it much sadder when it doesn't turn out.